Thomas Jefferson Quotes from his own letters and writings from 1787 to 1790. These years cover the latter half of Jefferson's years as America's Ambassador to France and the very beginning of his term as Secretary of State under President Washington. Most of these Thomas Jefferson Quotes come from letters to such people as James Madison, the Marquis de Lafayette and Peter Carr, Jefferson's nephew, to whom he wrote many letters giving him advice as a young man. Topics covered in these quotes include such things as his recommendations on how to study the Bible, the necessity of armed rebellion against tyranny and his love of his family and home, Monticello. Thomas Jefferson was one of the great leaders of the American Revolution. He wrote the Declaration of Independence, served as Ambassador to France, Secretary of State, Vice President and later became the 3rd President of the United States. 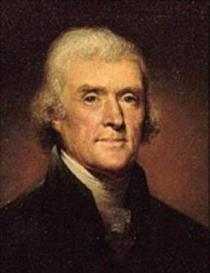 These Thomas Jefferson Quotes are listed chronologically with links to more from both before and after this time period at the bottom of the page. If you liked these Thomas Jefferson Quotes, you will also like our Thomas Jefferson Facts page.